A large number of peripherals and software enable customer-specific solutions. Whether they are operated in stand-alone mode, in a PC application or within a network – the rugged A8+ printers are always up to the mark. A2+, A4+, A6+ have been discontinued. Please refer to follow-up models SQUIX 2, SQUIX 4, SQUIX 6. "The cab printers enable us to realize everything that is needed. Thereby, we achieve very good results." 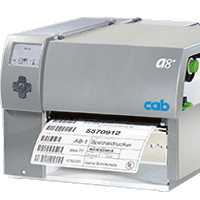 World‘s market leader for breast prostheses does labeling with cab printers for 20 years. The print head is pressed on by three plungers: One is fixed at the inner side, another is set in centered position and the third is set at the outer label margin. picking up core diameters of at least 38 mm (76 mm adapters for a better label winding are included in the delivery). The spring-mounted margin stop with a screw cap enables constant tension during material feed and therefore improves the accuracy of the imprint. for printing in a reserve loop. The print job is stopped by the Pause signal. The label that is currently printed will be completed. The rewinder is directly screwed onto the printer. Labels are optionally wound either inner or outer side. Electronic control by the swing arm ensures a smooth and tight winding. The external unwinder EU8 enables consistent label feed with heavy rolls. Outside and inside wound rolls can be processed. 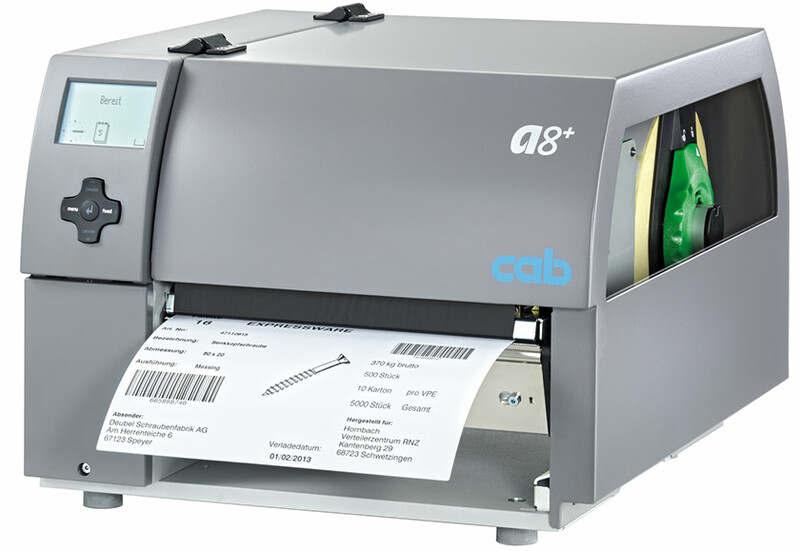 Label printer A4+ in operation at our customer Amoena medical technology.